It may have been a losing start for the new campaign, but returning half-back Simon Brown will have taken some joy at wearing a Sheffield Eagles jersey again. 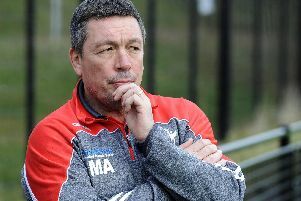 According to director of rugby Mark Aston, Brown’s career in rugby league was heading for a premature end until the phone call came from his old boss during the close season. After successfully working with the 27-year-old during his first spell at the club, Aston had no hesitation in pressing the former favourite back into service, but revealed he had to pull the ex-Hunslet man from the brink of retirement. “He was retiring this year but I have effectively dragged him out of retirement,” Aston told The Star. “He is only 26 or 27, so why is he retiring? He had lost the love for the game. “He didn’t want his story to be written for him. He didn’t want the last chapter to end like it was heading for. Brown’s second coming at Bower Fold ended in defeat against Oldham last Sunday, but the new look Eagles will take some heart from a solid first-half showing as they continue to play catch-up with the rest of the division. Aston insists the ex-York City Knights star can reproduce the form that saw him help the Eagles to Championship Grand Final success in 2012. “I know he can do the job for me, but I told him that I wanted to challenge him,” Aston revealed. “It will work but he has to commit and he has to be a bit tougher on himself. I want to get the best out of him.